This beautiful, multicolored box is an import from Universal Italy and was a fair bargain at about 45 USD. The contents essentially replicate the "Original Masters" box down to the tracks – twice reviewed here, and quite favorably – but adds two classic opera recordings that have been in-print and acclaimed since release. If you own the two operas on Decca Legends and the box from 2004, stop reading. There is nothing new, and no evidence that anything sounds better. I've read about some Tchaikovsky recorded for Decca in Paris, and it is not here. But for the rest of us, these are landmarks. To the commentary of the two gentlemen before me I can add little, save that I have included the singers and choir on the Beethoven Ninth for the first time in our archives. They had not been previously credited. I can also echo Gerald Fenech, who correctly noted that some of this material is available on Dutton (notably the London 'Pastoral', which is coupled with a rather shaky Beethoven Second). Finally, I confess that my relative youth and inexperience within record collecting meant that – aside from parts of Figaro and the Concertgebouw Third and Fifth – these contents are new to me. Like his son, Carlos, Kleiber the Elder was an obsessive and difficult musician. He was also a genius. His Beethoven with the Concertgebouw ranks highly even today. The Fifth is unrelenting in intensity, as is the Third. While the Sixth and Seventh can't be considered reference recordings given the competition, they still capture a unique orchestral timbre allied to an unquestionable artistic vision. Besides, that still makes them very good, though the Seventh is more subjective than we might expect given the source. His Beethoven elsewhere is a mixed bag. The London Philharmonic Sixth is forward-looking in the prominent woodwind focus, but I prefer the Concertgebouw account for its slightly more natural sonic qualities and superior playing. The Vienna Third was rejected by the conductor for release and not heard until after his death. It lacks the impact of his earlier version, though it certainly features better sound and the repeat in the first movement is observed. I still lean toward the earlier take, though both strike me as wholly valid. Some listeners prefer this later reading, and unlike the Sixth, it's hard to say if there's a clear winner. Finally, the 'Choral' Symphony receives a straightforward interpretation that gets bogged down by somewhat sluggish tempi and somewhat poor choral singing. However, the singers (stalwarts of the conductor's opera recordings) are less mannered than many quartets of the same period. The rest of the recordings are fabulous in their own way, though the sound is not ideal. The Mozart #40 is the version sans clarinets, and while I don't think that's going to make or break this purchase, let the record show that I prefer the revised version which includes them. Excellent wind playing and a crisp, taut feeling enlivens an excellent 'Great's from Cologne. The rest of the Mozart is fine, and the Weber remains a rarity. While none of these readings match the sense of discovery from the Concertgebouw, all of them have considerable merit. The opera recordings are superlative. Figaro still sounds great today, and features a blistering opening Overture. The singing is witty and full of charm. The very early stereo sound holds up reasonably well. Among the standouts are the men, the women have gotten less critical praise. As for the Strauss, it features – overall – a better balanced cast. The sound is very late monophonic, but one hears everything. The Vienna Philharmonic sounds more polished here than in their famous recordings with Clemens Krauss, to name an example of early Strauss on Decca. Both operas are the first "complete" readings of the works in question, and they remain important on historical and musical grounds. There are a few issues. 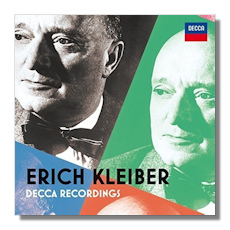 No word is made of re-masters, but the Decca Legends and Original Masters series overlapped, and I can't see Decca using anything older than that. The London 'Pastoral's has a Finale that's tracked differently than the Concertgebouw version. I hadn't read about this issue in reviews of either the Original Masters box or the Dutton, so either this is a new problem, or nobody cares except me. It does make direct comparisons tricky. The booklet holds less than ideal English and a lack of information on the recordings. Most annoyingly, there is no libretto. Again, if you have the Legends and Original Masters issues, you won't need this box. But if you have yet to explore one of the great conductors of the last century, then this is essential.